LG’s upcoming flagship was codenamed Judy for a while, but leaks have since confirmed that it will be called the LG G7 ThinQ and a new report from Android Headlines corroborates the different colors that the device will come in, along with their official names and the official render in tow. 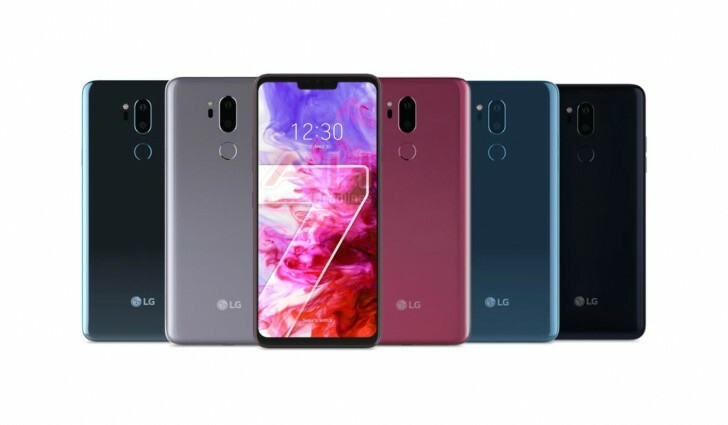 The LG G7 ThinQ will come in Aurora Black, Platinum Grey, Moroccan Blue, Moroccan Blue (Matte), and Raspberry Rose. Colors shall vary depending on the region, but all markets should see the Aurora Black one come. As we’ve seen in previous leaks. The LG G7 will have a notch at the top of the display, despite asking for feedback on Reddit about what customers thoughts were on “the notch situation”. It was likely too far into the phone’s production to even backtrack on the notch, but perhaps LG would take that feedback into consideration for the development of the LG V30’s successor, whenever that may be. The notch will house the phone’s in-call receiver and front-facing camera. Also, we are expecting a refined camera from the LG V30’s, one with the standard and ultra-wide cameras, which work independently from each other, and don’t offer portrait or zoom features. LG finds that the super-wide camera is a much more unique feature to have and would rather stand out in this way. Unlike previous LG models with dual cameras, the cameras will be arranged vertically instead of horizontally. Also, for the first time in a while, LG will be putting a side-mounted power key instead of having it right on the rear-mounted fingerprint scanner. There is also an additional button under the volume rocker, which suggests that LG could be adding an AI assistant shortcut. Our hopes are that it will be a programmable key to spite Samsung’s non-customizable Bixby button. The renders also suggest that LG will keep a simple “LG” branding on the back of the phone rather than include the “G” product line. By contrast, the LG G6 featured “G6” branding on the back with “LG” branding just under the display. Specs weren’t mentioned in this report, but we are expecting a Snapdragon 845, 4GB or 6GB of RAM, a 6-inch M+ LCD RGBW panel with QHD+ resolution and a taller-than-usual 19:9 aspect ratio, likely accommodating for the area above where the notch starts. Currently, rumors point to a May launch with a late-April announcement. Pricing is still up in the air.